Description: On March 30, Lee shifted reinforcements to meet the Federal movement to turn his right flank, placing Maj. Gen. W.H. Fitzhugh Lee’s cavalry divisions at Five Forks and transferring Pickett’s division from the Bermuda Hundred front to the extreme right. Warren pushed the V Corps forward and entrenched a line to cover the Boydton Plank Road from its intersection with Dabney Mill Road south to Gravelly Run. Ayres’s division advanced northwest toward White Oak Road. On March 31, in combination with Maj. Gen. Philip Sheridan’s thrust via Dinwiddie Court House, Warren directed his corps against the Confederate entrenchments along White Oak Road, hoping to cut Lee’s communications with Pickett at Five Forks. The Union advance was stalled by a crushing counterattack directed by Maj. Gen. Bushrod Johnson, but Warren’s position stabilized and his soldiers closed on the road by day’s end. This fighting set up the Confederate defeat at Five Forks on April 1. The Battle of White Oak Road was fought on March 31, 1865, 150 years ago today, along with the Battle of Dinwiddie Court House. This day’s actions were the twin penultimate battles of the Five Forks “mini-campaign,” and caused the fateful joining of Phil Sheridan’s cavalry force with Gouverneur Warren’s Fifth Corps, Army of the Potomac. March 31 would also feature Robert E. Lee directing events on the White Oak Road on the Confederate side. Before Warren ever received this reply, he had moved Ayres forward in the direction of the White Oak Road. This movement in the direction of such a sensitive spot goaded the Confederates, just like someone poking a stick at a hornet nest, setting off a wild back and forth fight that saw two Fifth Corps divisions flee in confusion and disorder. In yesterday’s post, I mentioned a Confederate council of war at Sutherland Station. It guided Confederate efforts on March 31. While George Pickett’s mixed infantry/cavalry force attacked Sheridan at Dinwiddie Court House in an effort to protect Five Forks, no less a personage than Robert E. Lee himself would oversee a division-sized attack at the White Oak Road. Lee, who was directing operations in the area today due to the consequences of any failure, would launch the attack in an effort to protect the White Oak Road leading west to Five Forks. If the Union troops were able to reach this point in strength and cut off Pickett from a direct connection with the remainder of the Army of Northern Virginia, Petersburg and Richmond’s days were numbered. As things stood at 10:30 a. m. on March 31, 1865, Ayres’ Fifth Corps division jutted out like an inquisitive finger, probing for the exposed and vulnerable Confederate communications along White Oak Road west of their intrenchments. Warren made a tactical blunder by sending Ayres ahead on his own, followed by Crawford’s Division in another line behind. Griffin, recently relieved by Miles’ Second Corps division to the east the night before, had moved down to the area just behind a small tributary of Gravelly Run. His position proved to be fortuitous. Fred Winthrop’s Brigade of Ayres’ Division moved forward just before 11 a. m. in an effort to entrench on the White Oak Road and cut Confederate communications. He was within yards of the road when the Confederate attack hit at 11. Robert E. Lee spent the morning watching the Union troops coming on, and when Winthrop’s Brigade made its fateful push north the Confederates were ready. Bushrod Johnson informed Lee that Ayres’ Division had its left flank carelessly in the air and Lee determined to take advantage. The problem was that the Confederates didn’t have a strong or cohesive force with which to attack. McGowan’s South Carolinians of Wilcox’s Division, Hunton’s Virginians of Pickett’s Division, along with Moody’s Alabamians and Wise’s Virginians from Johnson’s own division made up the available men. They weren’t used to serving with each other, but they were the units present and Lee had to make do with what he had. They would go into the fight under the immediate tactical supervision of division commander Bushrod Johnson. Kellogg’s First Brigade of Crawford’s Division was called upon to halt the rout. Kellogg deployed the 6th Wisconsin and 7th Wisconsin, famous regiments of the Iron Brigade, to stem the rout. But two regiments were no match for the body of men rushing for the rear. The Wisconsin men were pushed aside and forced to join the retrograde movement. The Confederates bagged many prisoners in this initial assault. Warren’s Fifth Corps suffered 464 missing this day, many of them in Ayres’ Second Division. The Confederates caused an unexpected minor disaster, but Lee soon realized this was a hollow victory. Only three of his four brigades (Wise was held in reserve) had attacked, and they would be in an exposed position close to the Union lines if they advanced. Content with the current gains, the Confederate commander gathered up his prisoners and had the motley though victorious attacking force reverse some fortifications Warren’s men had dug earlier. In this way they might still keep Warren off of the all-important White Oak Road. Though badly shaken, the divisions of Ayres and Crawford had escaped a more serious reverse due to the protective cover of Gravelly Run, Griffin, and Wainwright’s Fifth Corps artillery. The Confederate decision to call off the attack and entrench created a pause in the battle during the early afternoon hours. Grant was less than pleased when informed of the result, asking Meade why Warren fought his divisions in detail. He reasoned to Army of the Potomac’s comander that since the Confederates had come out of their intrrenchments to attack, they were now vulnerable and should be counterattacked immediately. Warren and his division commanders had more pressing issues to worry about than Grant’s displeasure. They feverishly worked to reorganize the Second and Third divisions in case of further assaults. Griffin’s First Division, which had held behind the branch of Gravelly Run and provided a rallying point for their comrades, would lead the afternoon counterattack. Ayres and Crawford would provide cover for his left and right flanks, respectively. Miles’ Division from Humphreys’ Second Corps would pitch in to the right of the Fifth Corps. Chamberlain’s cutting of the White Oak Road had major consequences for the April 1, 1865 Battle of Five Forks. Lee attempted to reinforce Pickett’s expeditionary force, but he had to send them north of Hatcher’s Run from the White Oak Road to the South Side Railroad at Sutherland’s Station, only then moving southwest to Five Forks. Despite the Fifth Corps mostly having moved on the night of March 31 to Sheridan’s aid at Dinwiddie Court House, Lee’s reinforcements took the more roundabout route and never arrived in time. 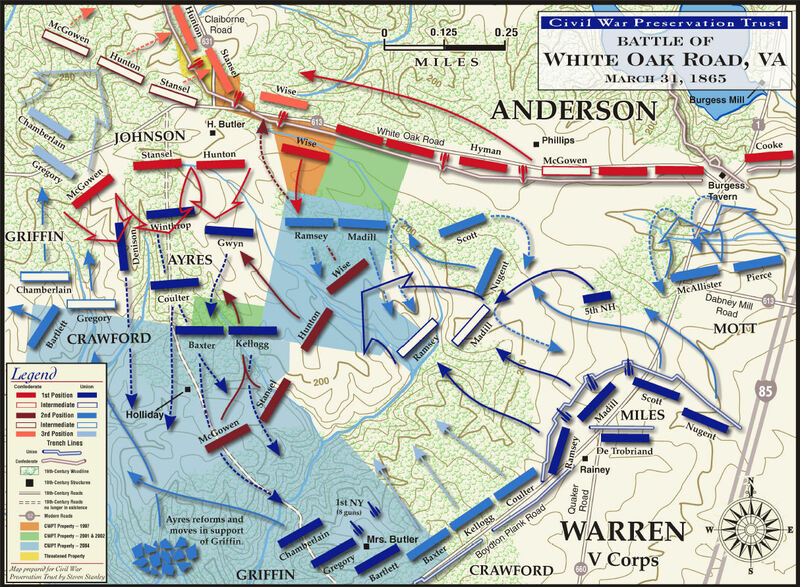 Though victorious at White Oak Road, the Federals had a potentially large problem on their hands on the late afternoon of March 31. A combined infantry/cavalry force under George Picket and Fitz Lee surprised and drove Sheridan’s Cavalry back almost to Dinwiddie Court House, in the left rear of Warren’s Fifth Corps. When it was realized that Pickett was severely pressing Sheridan’s cavalry force near Dinwiddie Court House to the southwest, Warren sent Bartlett’s Brigade to attempt a flank attack on Pickett’s Confederates. For more on the operations around Dinwiddie Court House on March 31, click here to read my post on that fight. The night of March 31 would see Warren receive a slew of contradictory orders from Meade, Grant, and Sheridan, all trying to get some infantry support for the beleaguered Sheridan. Warren’s actions, or lack of perceived action, would cost him dearly very soon. The Battle of Five Forks, and a day later the final assaults on Petersburg, lay in the near future.